NOTE: The courses in this bundle focus on Adobe Lightroom Classic CC, which is the new name for what has been known as Adobe Lightroom for about the last ten years. Adobe Lightroom is the go-to solution for top photographers for managing, optimizing, and sharing their photos. Tim Grey uses Lightroom to manage his catalog of more than 350,000 images (and growing!). The "Mastering Lightroom" bundle of video training courses will help you learn to truly understand and use Lightroom for all aspects of your workflow. It already includes over 19 hours of educational video lessons, with more content added regularly! The "Understanding Lightroom" and "Configuring Lightroom" courses will provide you with a strong foundation for your workflow in Lightroom. Put simply, these courses will help you get off to a great start using Lightroom. Or, if you've already gotten started using Lightroom, these courses will help you gain knowledge and improve your workflow. The "Organizing Photos in Lightroom" and "Optimizing Photos in Lightroom" courses alone feature over 8 hours of content. Additional courses will help you define and improve your overall workflow in Lightroom. One of the favorite courses in this bundle is "Lightroom Quick Tips", which provides a new lesson each and every week with a quick tip to help you get the most out of Lightroom Classic CC. For more than 20 years Tim has been helping photographers optimize their photography and workflow. He has authored eighteen books and hundreds of magazine articles that have been published in Digital Photo Pro, Outdoor Photographer, and other publications. He is sought out to present at some of the biggest photography events, and leads workshops worldwide. In short, he knows his stuff! Perhaps even better, Tim is highly regarded as a top educator, providing clear guidance on subjects that can sometimes be a bit complex. He has put all of his experience into producing this informative bundle of educational courses. Tim Grey will also present a series of exclusive live webinar sessions, only for those enrolled in the “Mastering Lightroom” bundle of video course. 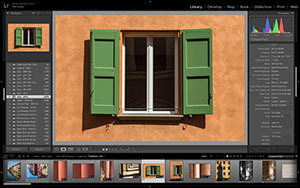 The webinar presentations will focus on specific challenges and questions submitted by photographers who are managing their workflow in Lightroom. Recordings of all of these webinars are included in the “Mastering Lightroom” bundle. NOTE: If you are a subscriber to the GreyLearning Ultimate Bundle you already have access to this course at no additional cost. Not already a subscriber of the GreyLearning Ultimate Bundle? You can learn more about it here.